The Pentagon has put the brakes on military cargo shipments traveling from Afghanistan to Pakistan, citing anti-drone protests that threatened truck drivers, a Pentagon spokesman said Tuesday. 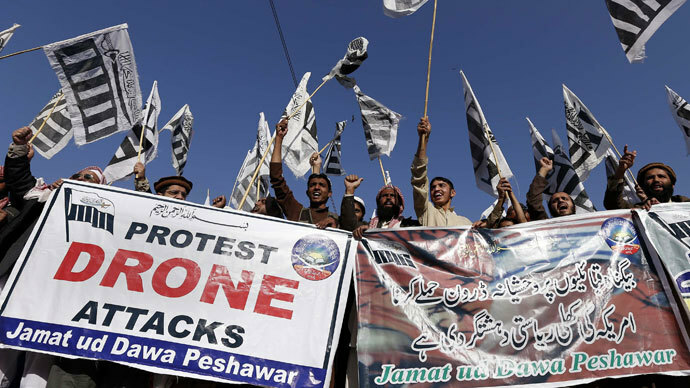 The key supply route, which runs from the Torkham Gate border crossing, has been the scene of protests aimed at the US drone campaign in Pakistan that has killed and injured hundreds of innocent civilians. Protesters, many of them armed with clubs, had been forcing drivers to stop their trucks and submit to forcible inspections of their cargos, occasionally turning back vehicles carrying NATO supplies. "We have voluntarily halted US shipments of retrograde cargo through the Pakistan Ground Line of Communication (GLOCC) from Torkham Gate through Karachi," Pentagon spokesman Mark Wright said in a statement. The US military depends on the Torkham crossing for transporting more than half of its shipments, with the rest being carried by aircraft. The suspension of cross-border shipments comes at a bad time for the US military, which is preparing to evacuate the bulk of its troops and equipment from Afghanistan by December 2014. The US military still has around 46,000 troops in Afghanistan, a figure set to fall to 34,000 by early next year. Meanwhile, as trucks continue to back up on the Afghan side of the border, Washington is holding out hope that Islamabad will bring the area under control and the supply lines will reopen. "We anticipate that we will be able to resume our shipments through this route in the near future," said Wright, the Pentagon spokesman. Many Pakistanis expressed outrage following a CIA drone strike on November 1 that targeted Hakimullah Mehsud, the leader of Tehrik-i-Taliban Pakistan (TTP). Prime Minister Nawaz Sharif was in the process of arranging peace talks with the Taliban when Mehsud was killed. Many took the assassination as Washington’s way of demonstrating, in very explicit terms, its disapproval of Islamabad’s talks with the leader of the Pakistani Taliban. Islamabad issued a statement condemning the assassination, saying such strikes were a "violation of Pakistan's sovereignty and territorial integrity." Hopes of Pakistan resuming negotiations with the Taliban appear to be receding, as Mehsud has been replaced by Maulana Fazlullah, a dedicated militant who led the attack on 16-year-old school activist Malala Yousafzai. Why the Pentagon would kill a leader such as Mehsud, who appeared to be prepared to conduct peace talks, is not clear. Meanwhile, this has not been the first time US military planners have been deprived of its supply routes. Pakistan closed its borders to NATO supply trucks for more than seven months after a US helicopter mistakenly attacked two Pakistani military posts near the Afghan border, killing 24 troops. Supply lines reopened in July 2012 after Washington issued a formal apology. Now it appears the Pentagon, which must transport thousands of military vehicles and weapons back home following 12 years of war, is paying for its relentless and sometimes reckless drone campaign in Pakistan as its critical supply routes out of landlocked Afghanistan are at risk. Although the US military has alternate supply routes through Central Asia, including the so-called Northern Distribution Network through Russia and Central Asia, those options require more time and are more costly. "While we favor shipping cargo via Pakistan because of cost, we have built flexibility and redundancy into our overall system of air, sea and ground routes to transport cargo into and out of Afghanistan," said Wright, the Pentagon spokesman. Meanwhile, US relations with Afghanistan are also suffering as Afghan President Hamid Karzai remains undecided over US plans to maintain a training mission of 8,000-12,000 troops in Afghanistan after NATO's mission concludes next year. US Ambassador to NATO Douglas Lute on Monday told journalists that the security deal was needed to grant $8 billion for Afghan security forces that will be expected to maintain peace and security in the Central Asian hotspot. "The longer [the Afghan-US impasse] goes on, the more that international support will erode," an anonymous US official told Reuters. If Karzai refuses to sign on to a bilateral security agreement with the United States, which would mean that Washington would have to make a full evacuation of its military assets, there could be many more trucks carrying US cargo stuck at the Pakistani border.